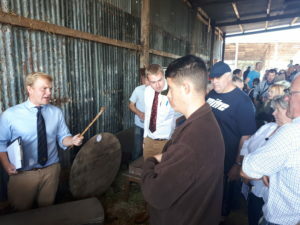 On Saturday 1st September we held a Complete Retirement Farm Dispersal Sale on behalf of Mr Eric Hewes at Papillion Hall Farm, near Market Harborough. Yet again, we were lucky enough to enjoy a warm and sunny day for the sale. The sale included an impressive range of tractors, farm machinery and equipment. There were also some more unusual items on offer, including railway drays, Haddon Stone garden planters and farmhouse furniture. 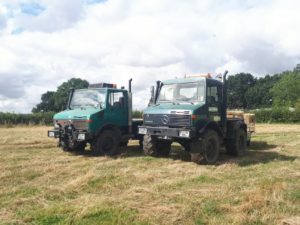 The top price of the day was for the Unimog U1600 which realised £23,600, followed by the John Deere 6320 Tractor selling for £22,600 and the John Deere 3200 Telehandler making £21,000. 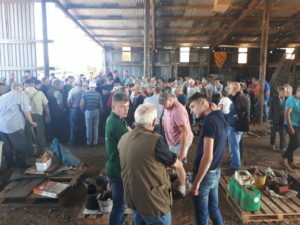 The auctioneers estimated that there were over 1,000 cars and farm vehicles in the car park, with bidders travelling from as far afield as Cornwall and North Scotland. There was a huge crowd of purchasers all day and the sale lasted 7.5 hours. The only problem during this highly successful sale was that the ice-cream van ran out of ice cream! 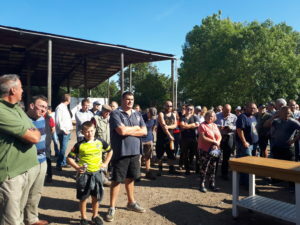 “The weather bought buyers from across the country, including a lot of local support producing a strong trade for all items, including household furniture and rural bygones. Our next auction will be a Complete Farm Dispersal Sale at Chadwick End, Solihull on 15th September. You can view the full list of forthcoming auctions on our auctions page.